Thank you ladies for sharing your creations with us! And since tomorrow is Canada Day, we would love to see your Canada Day layouts! 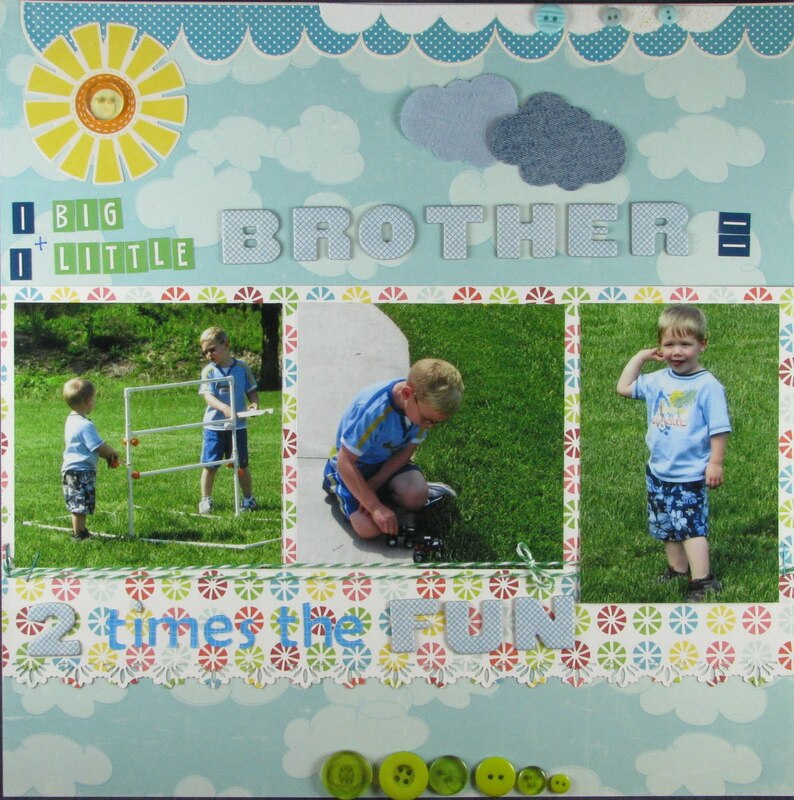 Just send them to us at ideas@scrapbookandcards.com. Of course we would also like to share 4th of July layouts so send them in too! And if you would like a chance to get published in our next issue or want to answer to Becky Fleck's PageMaps call, be sure to check out our fall call here! See you tomorrow for the release of the July Project 12 sketch and some new prizes up for grabs! On Monday, I encouraged you to get your Summer To-Do list complete so you'll never be at a loss for summertime fun. Of course, it goes without saying that you should keep the camera handy so you'll have plenty of photos to scrap when summer comes to an end. And today I wanted to share a few ideas for scrapping your warm weather memories. 1. Scrap a typical summer day. How do you spend your summer days? Is your schedule different this time of year? 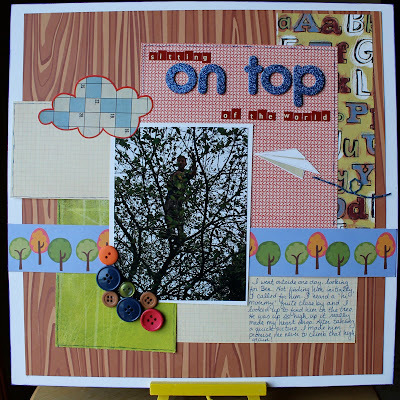 Document it on a scrapbook page! Around here, we spend most of the warm days at our neighborhood pool. I used days-of-the-week tags to highlight the frequency that we visit our pool, and chose bold, bright colors to match the summertime theme. 2. Scrap a favorite summertime treat. One of the best parts of warmer weather is the seasonal foods! From barbeque to fresh produce to homemade ice cream, everyone has a favorite. Scrap yours on a page dedicated to summer foods. My page features campfire treat of s'mores, a treat the whole family loves to make. 3. Scrap an overview of your summer. Chances are, you have hundreds of photos from your summer activities. And scrapping them all can be overwhelming. So why not do a quick "summer in review" page by picking 6-8 of your favorite photos that span your summer? I used eight photos and a few quick lines of journaling to create a snapshot of our summer adventures. 4. Scrap a photo that captures the summertime feeling. Some things just define summer: eating popsicles, backyard bbqs, lemonade stands. Pick one of your photos that screams "SUMMER!" and scrap it with a favorite summertime quote. I used photos of my son cooling off in our sprinklers and added some whimsical circular accents to create a scene that just captures my memories of summer. 5. Use a summertime color palette. Even if you don't have the perfect warm weather photos (yet! 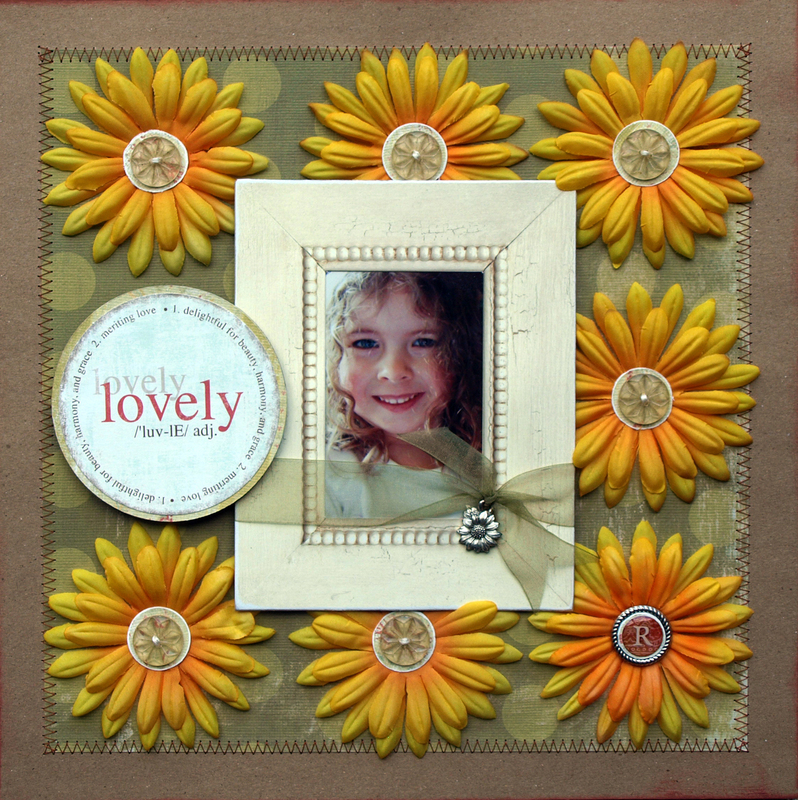 ), get in the summer scrap mood by scrapping a page with bright, saturated seasonal colors. I used vibrant shades of pink, blue, yellow and green on this page and balanced them with some doses of white, creating a color scheme that definitively summery! Summer holidays are almost here and I can’t wait to enjoy some crafting time with my kids. Whether it’s creating birthday party invitations, scrapbook pages of summer fun or wall art for our newly renovated house, it’s going to be a very crafty summer at our home. 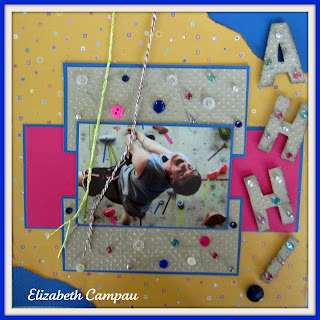 In the summer issue of Scrapbook & Cards Today I shared a layout about my mother. She is a seamstress and quilter. There is no doubt in my mind that the crafty apple does not fall far from the tree in our family. For this layout, I took advantage of the features of the Xyron Creatopia and used the fabric adhesive option to add die cut felt flowers. Supplies: Core'dinations cardstock and Sand-It Gadget tool, Jillibean Soup kraft paper, My Little Shoebox patterned paper, stamp and diecuts, Maya Road trinket pins, American Crafts buttons and layering tape, Sizzix flower dies, Quickutz letter dies, ProvoCraft embossing folder, Xyron Creatopia (fabric adhesive, Cutz, Shapez), Tsukineko ink, DMC embroidery thread, Font: Another Typewriter, other: felt, pattern paper. When I was growing up my mother worked full-time once I entered grade one. She would get a few weeks of vacation in the summer so most of my days were spent with my maternal grandmother. My grandmother taught me how to knit, sew, needlepoint, quilt, smock, paint, rug hook, braid, and hot glue gun. Yes, it staggers the mind to think of how many pinecone-spray-painted-gold-angels-blowing-golf-tee-trumpets I hot glue gunned one summer for a fall bizarre at her church. We would make nylon-baby-faced-fridge-magnets out of empty creamers. We would make God’s Eyes and Barbie clothes for every season. I remember spending one particularly hot summer rug hooking a large Mary Maxim wool creation which left me dehydrated at the end of each day. Every day with Grandma was like a craft boot camp and I loved every minute of her wisdom and attention. The Xyron Creatopia got me thinking, “What other crafty elements can I start adding to my layouts and cards? How about knitting?” That’s something I haven’t added to my paper crafts at this point. I literally ran next door to my neighbour, Kimberly, and asked if she had any knitting needles since I have lost mine in our recent move. She didn’t have any but she did have some bamboo skewers which worked even better than I had planned because I could trim them to fit the card. After I have knitted several rows I ran it through the Xyron Creatopia to add adhesive to the back. My sewing machine added a nice border to the card and - Voila! Supplies: Jillibean Soup kraft paper and patterned paper, Patons yarn, Xyron Creatopia fabric adhesive, Font: Another Typewriter, other: sewing machine, thread and bamboo skewers. What can you add to your paper creations? 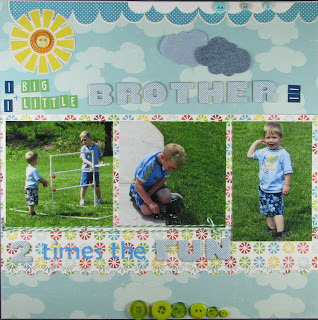 Have you tried adding hand-stitching to your layouts and cards? Do you have scraps of fabric which could be used to make gorgeous flowers? Be sure to let me know which crafting techniques you might add to your future projects or which ones you are already using. 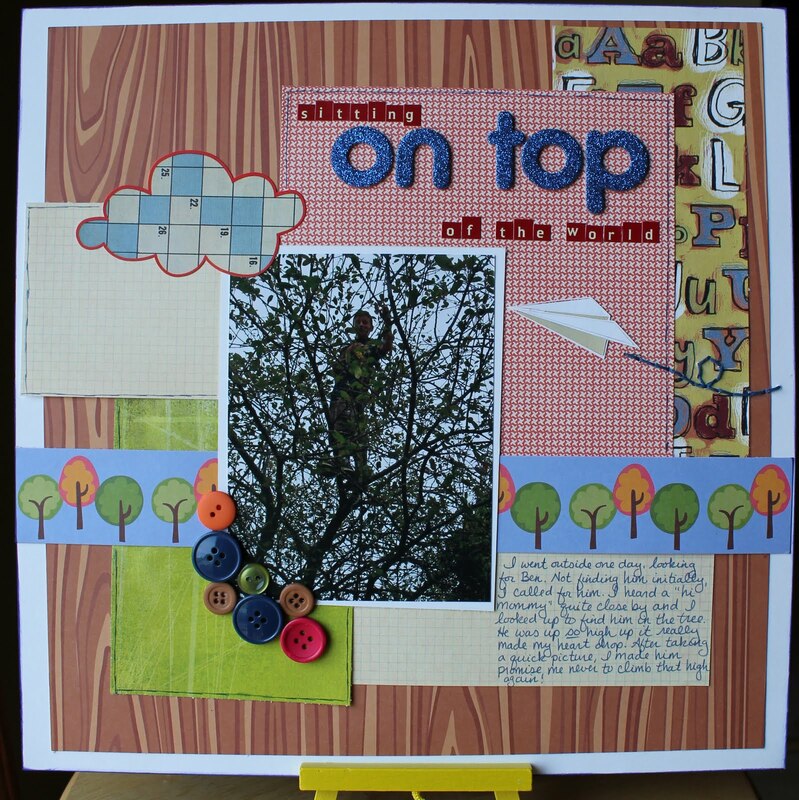 Do your crafting guru proud and add show off your skills in your next scrapbook or card project! Designer Challenge with Lisa Dickinson! Hello friends! Lisa Dickinson here, happy to report that summer has finally arrived in Colorado (hopefully in your neck of the woods, too!). And if your summer is anything like mine, you have high hopes for accomplishing lots of fun summertime activities over the next few months. This year, my kids and I decided to make a master list of fun things we'd like to include in our summer vacation. We wrote them down on tags punched from cardstock and pinned them to a bulletin board where we'll see them everyday. As we do activities, we'll remove them from the board, and hopefully by the end of August, the bulletin board will be empty and our summer itinerary will be full! I plan to keep the "completed" tags and file them with the photos I take this summer to help remind me of our adventures and serve as prompts when it comes time to scrap them. For all the latest join us on Facebook! Click here! Good morning and thank you so much joining us today! It has been an exciting few months putting together our summer issue and I'm sure you'll agree that it is filled with seasonal inspiration, brand new products, not to mention tips, tricks and techniques! Our team of designers and contributors have truly outdone themselves. We have so much to share today so go grab a cup of coffee, a tea or my personal favourite a latte and get comfortable! First, here is our summer issue that you can view online OR you can download to your smartphone, iPad, Playbook, etc...for FREE! The Colour Suite is a brand new monthly colour inspiration challenge by design team member Summer Fullerton starting July 15th on our website! 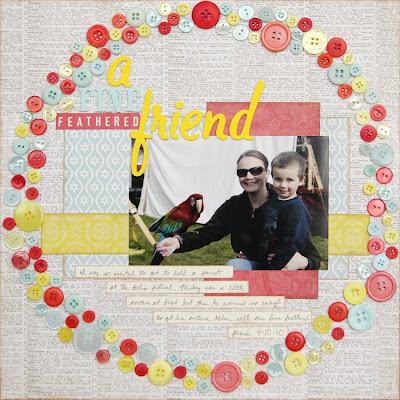 With Summer's extraordinary eye for colour, she will provide you with a beautiful colour palette and inspiration layout to get those creative juices flowing! Be sure to join us for the debut of "The Colour Suite" on July 15th! Of course, release day would not be complete without...a GIVEAWAY! One of our top 10 most wanted items from this issue is the brand new Presto Punch from Spellbinders and our friends at Spellbinders have offered a Presto Punch and Font punch template for one lucky reader! OH YES THEY HAVE! "Presto Punch™, the first automatic Punch and Embossing Machine! Presto Punch offers the easiest, most convenient solution for paper punching. Its innovative design and one touch operation virtually eliminates the need for a multitude of bulky, space-consuming punches. With Presto Punch, you can cut and emboss effortlessly and store more than 30 punch designs in the space of just one standard punch." The Presto Punch is brand new and just starting to ship so you will be one of the first of all your friends to have one! And of course, we would be remiss if we didn't offer a one year subscription to our lucky winner as well! Just leave a comment below telling us what you really liked in the summer issue before Thursday, July 7th at 6:00 p.m. EST for your chance to win this amazing prize. Good luck! We also want to share last week's winners who will automatically receive a copy of the summer issue! Winners are Kim Holmes, Jackie Hyland, Theresa Miller, Heather Pitre and Melissa Mason. Thank you to all who entered. Our subscription manager will be in touch for your mailing information. Now, either run to your local store that carries the summer issue or hit download above and enjoy what our designers have put together for YOU! And if you would like it delivered to your door, we've got a special price on subscriptions JUST for the weekend! Subscribe HERE! A special thank you to the Scrapbook & Cards Today team for another job well done! Have a great weekend! Lisa Dickinson is joining us next week so don't miss it! Good morning! ONE MORE DAY until the summer issue launches and we are SUPER excited to share it with you! Be sure to join us right here tomorrow at 10:00 a.m. for the reveal and...some prizes of course! 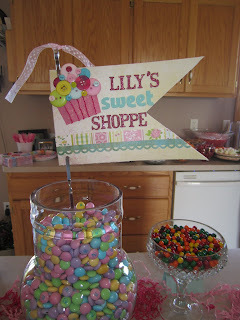 On Monday, Summer challenged our blog readers to dig into their stash and use up their buttons. If you were in my scraproom you would be digging for awhile! Why do those cute round things just scream BUY ME? 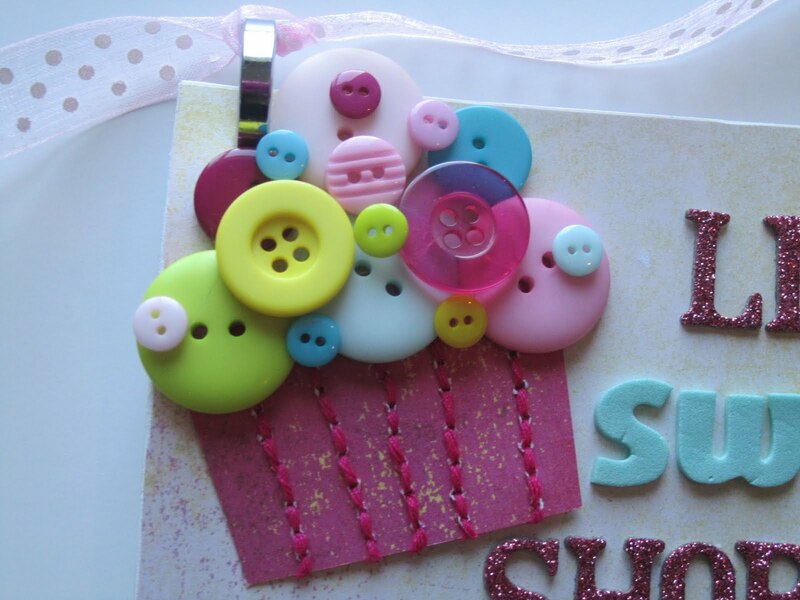 Many of you shared the same thought which once again tells me I am not alone in my love of buttons! Today we thought it would be a perfect time to share some of those projects we received and inspire you on how to use those darling things! Just remember to link your project back to Monday's post for a chance to win some great buttons for your next project(s)! We also want to let you know that Crop & Create Saskatoon is selling out fast! We now have two classes sold out and a couple of others very close so be sure to register quickly! We cannot wait to share an exciting weekend with you!